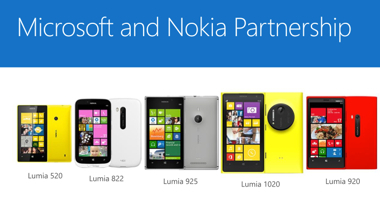 Microsoft is spending about $7.2 billion to acquire Nokia’s core cellphone business. Of that, $5 billion is for Nokia’s devices business. Nokia’s patent portfolio includes some 8,500 design patents. It also includes approximately 30,000 utility patents and patent applications. About 32,000 Nokia employees are expected to transfer to Microsoft as part of the deal. But 56,000 Nokia employees will remain at the company once the deal has closed. With 8.7 million units shipped, Windows Phone had a 3.7 percent share of global smartphone market in the second quarter of 2013, according to IDC. Windows Phone has greater than 10 percent share in nine markets, according to Microsoft. Windows Phone is outselling BlackBerry in 34 markets — again, according to Microsoft. Nokia accounted for 81.6 percent of all Windows Phone smartphone shipments during the second quarter of 2013. Microsoft’s gross margin on sales of Nokia’s Windows Phone handsets before the deal: Less than $10. Microsoft’s expected gross margin on sales of Nokia’s Windows Phone handsets after the deal: More than $40. Nokia’s share of the smartphone market was 49.4 percent in 2007. By fall of 2012, it was 4.3 percent.